Photo: Roy Rochlin/Getty Images. Graphic: Natalie Peeples. 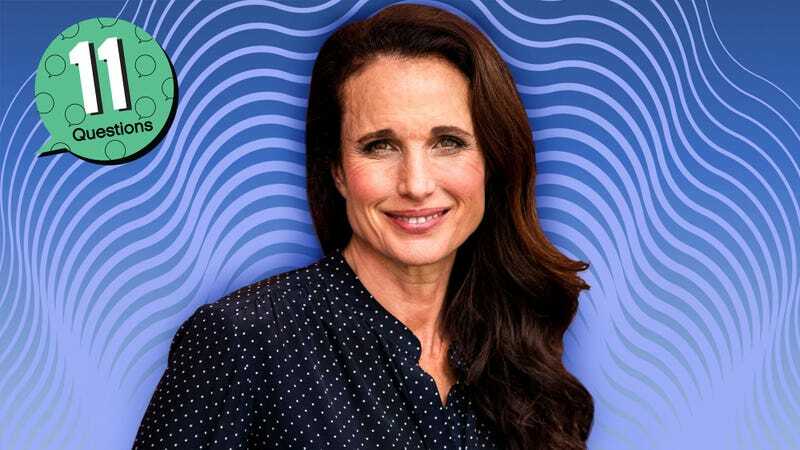 A working actor for more than 30 years, Andie MacDowell has played the drawling ingénue in everything from Four Weddings And A Funeral to Magic Mike XXL. She confounded Bill Murray in Groundhog Day and went toe to toe with any number of Michael Keatons in Multiplicity. Now, she’s starring opposite Chris O’Dowd in Love After Love, an emotional drama about the death of MacDowell’s onscreen husband—and O’Dowd’s onscreen father. 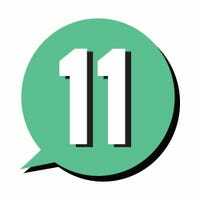 It’s a soul-searching concept for a film, so we thought MacDowell might want to do a little more soul-searching via our 11 Questions. Andie MacDowell: Oh, I have a lot of optimism because I’m curious and adventuresome, and I want to have new experiences. That’s what makes me optimistic. AM: I loved the movie Unstrung Heroes that I did with Diane Keaton. I also loved a movie I did called Crush. I don’t know how many I’m allowed to say. I also think Multiplicity should have done better, because I thought it was a brilliant movie and Michael Keaton’s great in it, and that was something that happened with a change of studio executives, so they didn’t publicize it the way they should have, but it’s a great movie. The A.V. Club: What specifically did you like about Unstrung Heroes? AM: I think it’s a beautiful piece of art. I think that Diane is a very intelligent and thoughtful director and it’s more of an art film, but I think it deserved more interest and credit for what she achieved. I thought the performances were all really beautiful, strong, and different. It was unique. It felt like something Diane had created. AM: I wish I remembered. I loved the Beatles, so let’s say Abbey Road. That’s a good one. AM: No, not ghosts like what you see on TV, but maybe spirits. AM: I think ghosts seem kind of comical, but spirits are more believable to me. I don’t know why. Maybe spirits are there to come and help you out a little bit. I don’t think they move stuff and are sad and angry and all that. I think I could believe that there could be spirits. I like that idea. AVC: Do you think there are both helpful spirits and bad spirits? AM: I wouldn’t know that I would think that deeply on it. I would like to think that the only spirits that would remain around me would be the ones that would be good. So we’re just going to go for that. Because why not? AVC: Any specific hot sauce? AM: Frank’s is good. I’ll take Frank’s. Any vinegar-based hot sauce. AM: It kind of depends on what’s going on inside of me. I think where I don’t know anyone. I’d say any large social situation where I just don’t know anyone, that’s uncomfortable. AVC: What’s an example? At a movie premiere, you’d know people. AM: I would have someone with me. I’d say any place I have to go off by myself and I don’t know anyone, like it’s a whole new group of people and I don’t know anyone. That’s pretty stressful. AM: I’m doing it. I’ve got my dream job. I got really lucky in that I’m doing what I dreamed of. I dreamed of that, and I also dreamed of being around horses. Right now, I’m not around horses as much as I’d like to be, though. I wanted to be a mother, so I’ve got that as well. AVC: In theory, you could have access to horses as part of your job, depending on the role. AM: That’s true. I should make that happen. I’ve done it, but I need to make it happen again. AM: CNN News. I’m really boring. I don’t have regular television at home, so I watch CNN News, or travel shows. AVC: Are you a cord cutter or are you morally opposed to owning a TV? AM: Oh, I have a television. I just don’t have regular television, so I can’t turn on the news. Let’s put it that way. I do Netflix or Hulu or those things. I can stream. AM: They can definitely make a good piece of art, but that doesn’t mean you have to be fond of them. I would have a hard time with that. The only reason I say that is because I heard Picasso beat his wife. I used to like Picasso, and I have to say I like him a lot less. AVC: There are probably tons of people like that—great artists who lived years ago—that did horrible things that we just don’t know about. AM: It depends on what you hear and how truthful the information was, but you can Google it and read about it. With Picasso, I used to love going to his museum in Paris, and now that I know that, I’ve drawn my line. You don’t beat women. You don’t do anything to children. I mean, people can still love people. Other people can love his art. I just don’t like it. It leaves a bad taste in my mouth. Let’s put it that way. AM: Oh my god. Maybe being pushed to go back to work after I had babies. Stuff like that. People wanted me to work right away, and I did it. I did it. I worked right away. It was painful, and I felt a little bit inappropriate, but I did it. AVC: How soon did people want you to go back to work? AM: I think, like, right after they were born. But, you know, I think times are changing. I think people are much more sensitive to our needs now. And also I’m older. I would know how to say no. I was pretty pliable. I was always pretty pliable. People used to push me around, but I’m harder to push around now. AM: This is like a question my kids ask me. I hate these kinds of questions. Why in the hell would I want to do that? I don’t have my grandkids yet, so if I don’t get older, I’ll never know them. I would’ve missed out on that. I can’t pick an age. I’m so sorry. I can’t play that game. You can say I refused to answer that question. Bonus 12th question from Reggie Watts: Would you ever eat lab-grown meat? Why or why not? AVC: Like steaks that are scientifically made in a lab, rather than coming from a cow. AM: No, no. I don’t think it’s going to be necessary. I don’t think that’s something I’m ever going to have to worry about. Maybe somebody in the future will have to worry about it, but I’m going to say no. That’s just not going to happen. AM: Okay. I’m trying to think.